Want to play an animal guessing game? Try reading If Not for the Cat by Jack Prelutsky. But, if you really want to solve the puzzles yourself without cheating, have someone else read the book out loud, hiding the illustrations. Then take a peek after you make your guess. Prelutsky composed seventeen animal haiku for this masterfully written puzzle book of poetry filled with stunning illustrations by Ted Rand. Even those that typically don't enjoy poetry will most likely find the book entertaining. Seventeen syllables each haiku and seventeen different animals -- it's pure brilliance with lines like, "I, the hoverer, / Sip the nasturtium's nectar / And sing with my wings." Hum a happy tune whilst you try to figure that one out. 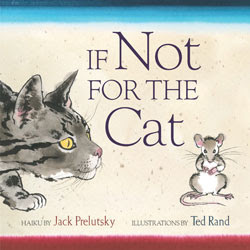 We won our copy of If Not for the Cat from Playing by the Book last month and have enjoyed the book immensely. For the last few months, I've been discussing syllables with my daughter and clapping words out, so she enjoyed learning the 5-7-5 structure. 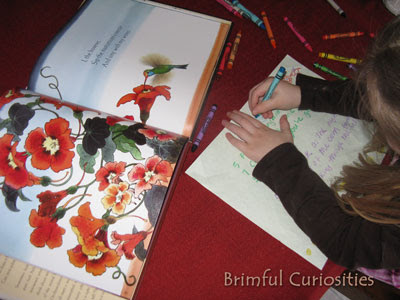 This is one of those books that appeals to all ages, and it is a perfect book for teachers to use while teaching the haiku format. Oh, one of my favorite books - so lovely. It's so different from Pretlutsky's other poetry and the artwork is amazing. This post was so much fun to read. Loved each and every haiku. If Not for the Cat makes me laugh every time I read it. Which was many times, all in a row.